David Gilmour played on TV last night, only for once he didn't have keyboardist and Pink Floyd founder Richard Wright by his side. Performing on the BBC music show Later...With Jools Holland, Gilmour paid a poignant tribute to Wright, who died of cancer last week, by singing Remember A Day, written by Wright. The song appeared on Pink Floyd's 1968 album Saucerful Of Secrets. Gilmour praised Wright, saying he had "an elusive quality, let's call it soul, that created a sound that glued the whole Pink Floyd thing together. You notice it when it's gone." Sadly, Wright was due to accompany Gilmour on the TV show, but sent the guitarist a text message three weeks ago saying he would not be able to play. Gilmour described Wright as "shy and quiet. He was just a very self-effacing but very talented, lovely chap. We're incredibly sad to have lost him." 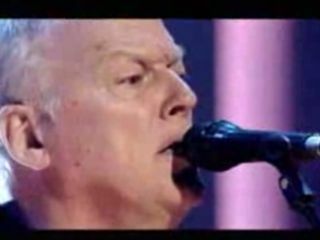 Here is a YouTube video of David Gilmour's performance. The full program will air this Friday (26 Sept). MusicRadar's community has voted The Great Gig In The Sky, from Pink Floyd's legendary The Dark Side Of The Moon album, Richard Wright's finest moment. Our poll last week was close, with Us And Them also getting many of the 1200+ votes, but The Great Gig... remains, according to you, Wright's crowning glory. Meanwhile, Fender has started shipping the David Gilmour signature Black Strat. And the Fender website is also hosting a clip of Gilmour (with Wright on keys on co-vocals) playing Comfortably Numb, from Gilmour's Live In Gdansk DVD.